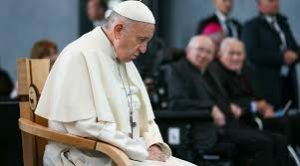 In some of his recent homilies and comments the Pope has suggested he is being like Jesus when he retreats to “silence.” When Jesus was at trial before Pilate he kept his mouth closed and was silent. Pope Francis has made it clear that this his position regarding the charges against deviant and sinful clergy, even bishops and Cardinals and his own suspected collusion. In the face of credible accusations and egregious sins committed by his Cardinals, bishops and priests — he remains silent. With rampant homosexuality flouted by many of the clergy with evil practices and moral compromises I suggest this is no time for silence. All of this is only exacerbated by the Popes own comments and writings creating confusion and division among the faithful. Might I suggest a better illustration? 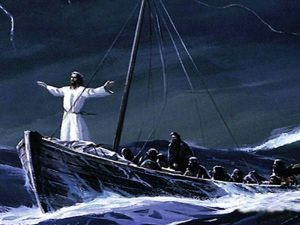 When Jesus and his disciples were in a boat in a storm and the boat was about to capsize, what did Jesus do? Did he remain silent and tell his disciples to be silent and just to pray? He did not. He stood and exercised his authority. He spoke out loudly to calm the storm and save his disciples. He was not silent in the storm but did what was necessary to set the situation right. Often in the Bible boats are images of the Church tossed by the waves. Jesus is in the boat with us and is not silent but ACTS! As his Vicar on earth, should not the Pope do the same? Pope Francis appears to be hiding something under a bushel. Is it a light or something else?